Chara tomentosa. Top of plant.. 01 Jan 0001. Anders Langangen. Adjective (Latin), tomentose, i.e., thickly and evenly covered with short more or less adpressed curled or curved matted hairs (Stearn 1973). Danish: Tyk kransnål (Langangen 2007). English: Coral Stonewort (Stewart & Church 1992). Swedish: Rödsträfse (Tolstoy & Österlund 2003). In this species the plants are robust, from 10  60 cm long, and the axis is up to 2 mm in diameter. Parts of the plants, especially young plants have a red colour which is an important character for the determination of the species. Plants from deeper water are green. The plants are usually heavily encrusted. The branchlets are 6- 8, short, each with 4- 5 segments. The stem cortex is diplostichous, tylacanthous. The spine cells are solitary or geminate, swollen, and similar to the stipulodes and the bract-cells. The species is dioecious. 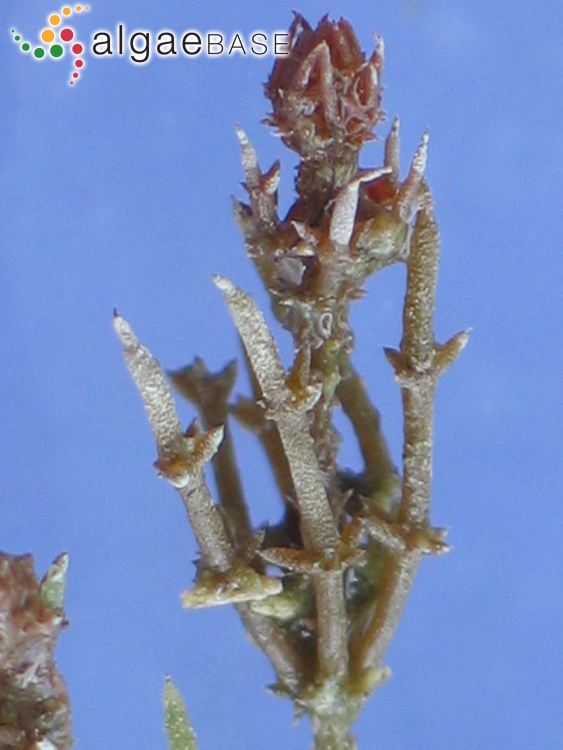 Gametangia are at the 2-3 lowest branchlet nodes. The oogonia are up to 1.2 mm long. The oospore is brown. The antheridia are very large and up to 1.5 mm in diameter. Chara tomentosa is found both in freshwater and brackish water, the last in the Baltic Sea (red parts on the map). It is found within the salinity area 4.5  7.5 PSU, and it is presumed that lower or higher salinity are natural limits for the distribution of the brackish water form. The species is found in sheltered places, bays, coastal lagoons on soft muddy bottoms down to 3 m depth. In freshwater Chara tomentosa is only found in calcareous waters, Chara- to Potamogeton-lakes. C. tomentosa is a perennial species. It grows down to a depth of 4-5 m, on limerich sediments. Often the species is found in dense, mixed populations with other Chara-lakes species. Fertile plants are normally found in June to September. Ripe, brown oospores are rare, and sexual reproduction is therefore ineffective. This is, in addition to its special habitats one of the factors which limits the distribution of the species. Type locality: Europe (Silva 1996-to date). Lectotype [per R.D.Wood 1960]: Linn (Ahmadi et al. 2012: 379). Mannschreck, B., Fink, T. & Melzer, A. (2002). Biosystematics of selected Chara species (Charophyta) using amplified fragment length polymorphism. Phycologia 41: 657-666. Ruprecht, F.J. (1846). Symbolae ad historiam et geographiam plantarum Rossicarum. pp. -242, 6 pls. Petropoli [St Petersburg]: typis et impensis academinae imperialis scientiarum. Willdenow, C.L. (1805). Du genre nommé Chara. Mémoires de l'Académie Royale des Sciences et Belles-Lettres [Berlin], Classe de Philosophie Expérimentale 1805: 79-90, pls I, II. Accesses: This record has been accessed by users 2610 times since it was created. Henricson, C., Sandberg-Kilpi, E. & Munsterhjelm, R. (2006). Experimental studies on the impact of turbulence, turbidity and sedimentation on Chara tomentosa L. . Cryptogamie, Algologie 27(4): 419-434. Kunachowicz, A., Luchniak, P., Olszewska, M.J. & Sakowicz, T. (2001). Comparitave karyology, DNA methylation and restriction pattern analysis of male and female plants of the dioecious alga Chara tomentosa (Charophyceae). European Journal of Phycology 36: 29-34. Libbert, E. & Walter, T. (1985). Photosynthetic production of a brackish water community of Chara tomentosa L. and its dependence on environmental conditions. Int. Rev. Ges. Hydrobiol. 70: 359-368.